From 4 to 8 December 2017, 15 youth trainers were trained in Design Thinking. The Startup Incubator Gambia (SIG), in collaboration with the Youth Empowerment Project(YEP), provided this training as a first step toward promoting innovation in The Gambia’s business sector, giving young people the tools to create innovative solutions to customer needs. Design thinking is a method which has been pioneered by organisations, such as the Stanford School of Design (d.school) and the consulting firm IDEO, and it has been adopted around the world, by major firms like Apple, Samsung, and IBM. The methodology draws from designers’ instruments to meet people’s needs and desires in order to develop new and relevant solutions. One way of thinking about Design Thinking, is placing emphasis on people. This way of thinking is also called Human Centred Design, which was the focus of this one-week training of trainers. Emphasize. Participants conducted interviews with stakeholders to identify the needs to address with the solutions they would develop. Define. Based on the insights they had gathered in the previous stage, the teams defined clear problems statements to address. Ideate. The groups found innovative solutions by generating large numbers of ideas to the problem they had identified in the previous steps. Prototype. The participants made prototypes of their solutions, gathered feedback from one another and the YEP team, and improved their solutions based on the feedback. Pitch. In a final step, the teams prepared pitches of their solutions and presented them to the rest of the group. In the afternoon, the participants practiced facilitating the different stages, and preparing to teach the methodology to others. Throughout the training of trainers, the participants showed a high level of motivation and commitment to mastering the methodology, and to becoming top-trainers for other young people in The Gambia. Alieu Jallow, the founder and project manager of Startup Incubator Gambia (SIG), was highly pleased with the workshop. In his remarks during the closing ceremony, he concluded that co-organizing this workshop together with YEP was one of the best decisions he had made. He added that he has high expectations of the group of newly trained trainers for bringing this methodology to youth across the country, giving more young entrepreneurs the tools to innovate in their businesses. 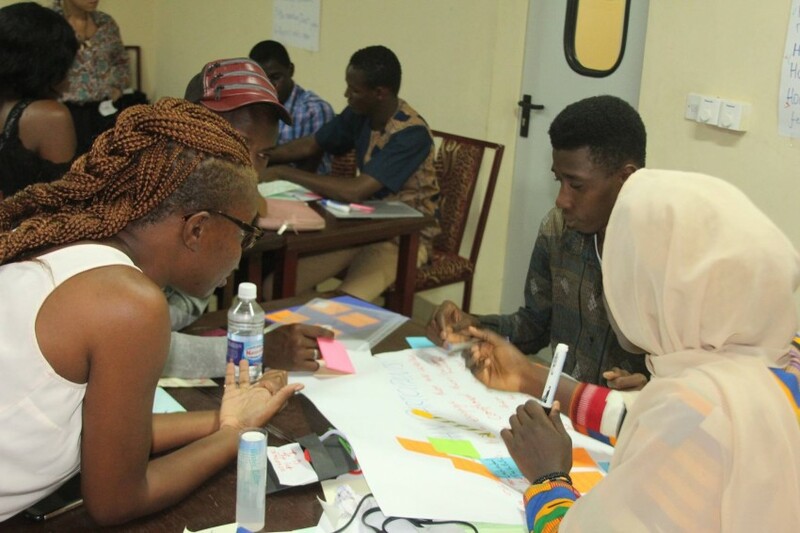 The training of trainers on Design Thinking fits well into The Gambia Youth Empowerment Project (YEP), which considers a market-led approach and entrepreneurship as some of its integral elements. The four-year project supports youth employment and entrepreneurship in order to address the economic root causes of irregular migration. By improving the employability of youth, especially potential and returning migrants, increasing income opportunities along value chains and helping young entrepreneurs to connect to trade and tap into the digital economy, this project aims to change the current migration trends and contribute to building the long-term growth and economic competitiveness of The Gambia. During the closing session of the training, Baboucarr Sallah, Operations and Finance Officer of YEP, emphasised to participants that it is the goals of YEP Gambia to build innovative and creative minds to promote positive change and to create the needed employment in the communities. Moreover, he congratulated the participants and described the 15 trainees as some of the luckiest Gambian youth for having had the opportunity to be part of this unique training. He urged the newly trained trainers to make the best use of their new skills and to share their new knowledge with others. To read more about the workshop and the closing session, check the article by the Stone Circle. Short Introduction to Design Thinking by the Institute of Design at Stanford 5 Stages in the Design Thinking Process – a summary of the different stages of the process by the Interaction Design Foundation. Design Thinking Comes of Age, this article from the Harvard Business Review talks about the adoption of Design Thinking by organizations. Design Thinking: A Unified Framework For Innovation - this Forbes article explains some of the origins and applications of design thinking. Designers – think big! – A TED Talk by IDEO CEP Tim Brown. How Samsung Became a Design Powerhouse by the Harvard Business Review.